Background, close ups, meaning/interpretation… of my new piece: Infinite Objectivity. Infinite Objectivity: digital painting, @ 12×6 ft at 150 dpi. CLICK FOR FULL SCREEN VERSION. This image speaks for itself, and I’d prefer that people gave it a good look, if you haven’t already, before reading what my intentions were. You know, give it a chance. The first things I’d want people to know about this piece is that it’s very large (can be printed high quality up to about 12 ft wide (360 cm); the robots are my own design; and up close it looks like an Impressionist painting. Ideally one could see it as a large print, or on a very large monitor, so the details and overall image could be taken in at the same time. Here’s a gallery with lots of details so you can see what it looks like up close and personal. Click on any image to go into the gallery. If you follow my blog you already know this sort of textured surface is a standard feature of my digital paintings. 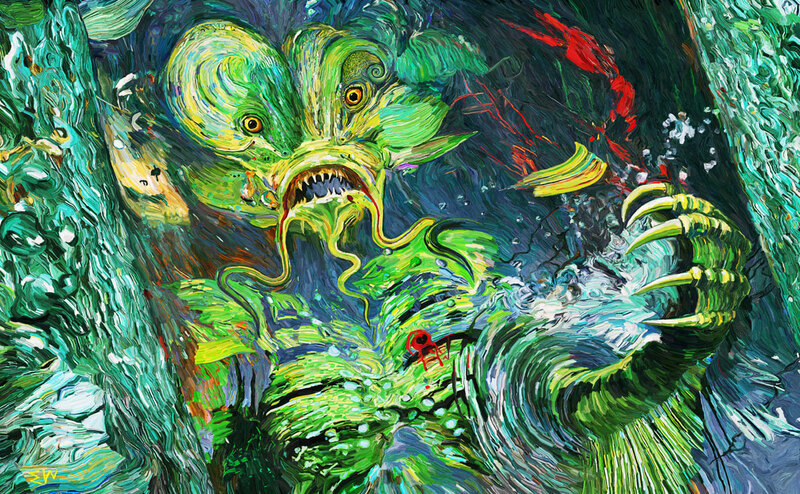 For what it’s worth, I haven’t seen anyone else take digital impasto to this level. 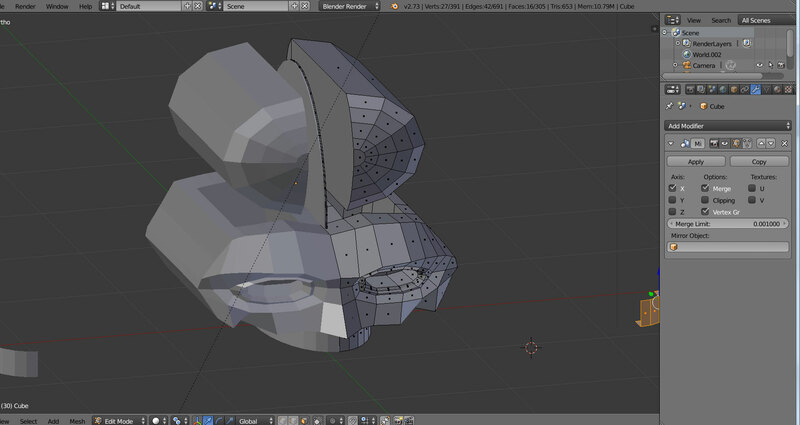 I used the free 3D powerhouse Blender to create the robot heads from scratch. I assembled them from cubes and cylinders. 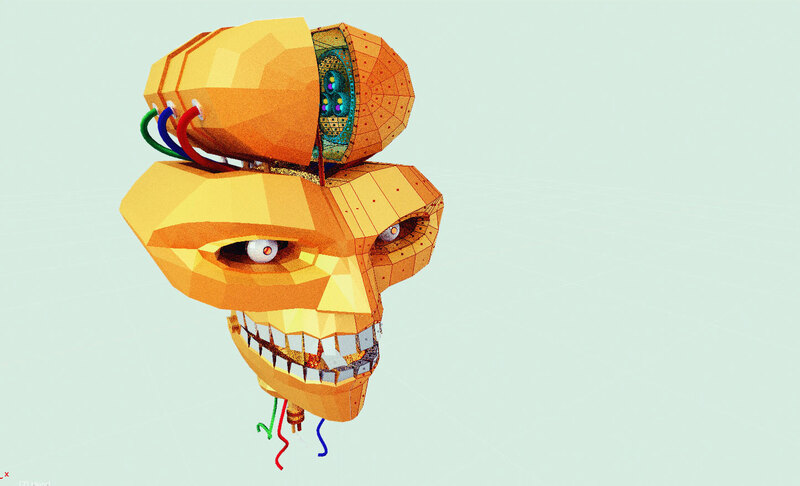 Below you can see the very early stages of concept development in Blender. I wanted to combine the peculiarities of software and my imagination to come up with an original robot design. I sought a classic look (with a bit of the Terminator), and for it to also look like it could have been made in a home laboratory. But the main thing was, unlike most robots which are exaggerated hulks built for mech combat, I wanted mine to focus on the brain, and artificial intelligence. My initial inspiration was to have two hemispheres for the brain, and to have it sit on top of the head (as opposed to in it). Early concept with focus on a brain wtih 2 hemispheres. And here you can see some of the design for the inside of the brain. 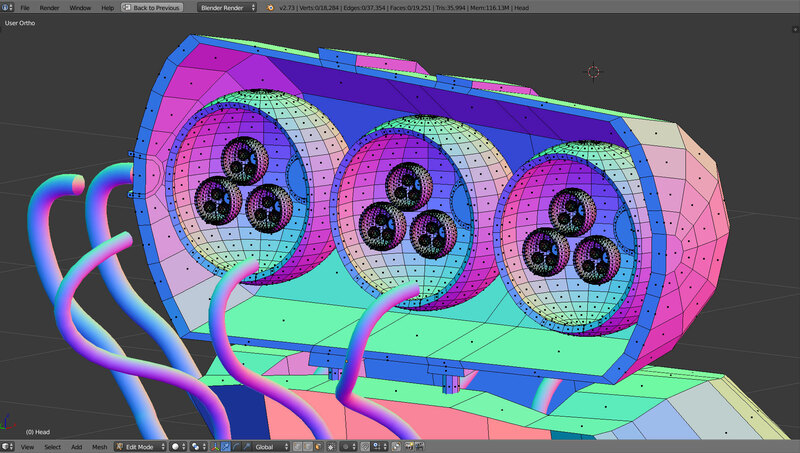 I modeled the inside of the brain in 3D. Here’s another version when I was working on different color possibilities. It clearly shows the cables going from inside the head to the brain on top. Next is a gallery of more stages of developing the robots. From the beginning I intended to have 3 heads with a bar connecting them, and one on the furthest end exploding. Eventually the bar became a thick cable with two smaller cables. I also added rods which stem at the bottom of the neck and continue through the top of the head. Images are in chronological order. I already mentioned the textured surface, which should remind people of paintings by the Impressionists, Post-Impressionists, Expressionists, and other impasto painters. The most obvious influence for brush strokes is, of course, Vincent Van Gogh. I’ve admired Vincent’s brushstrokes for decades. Yeah. 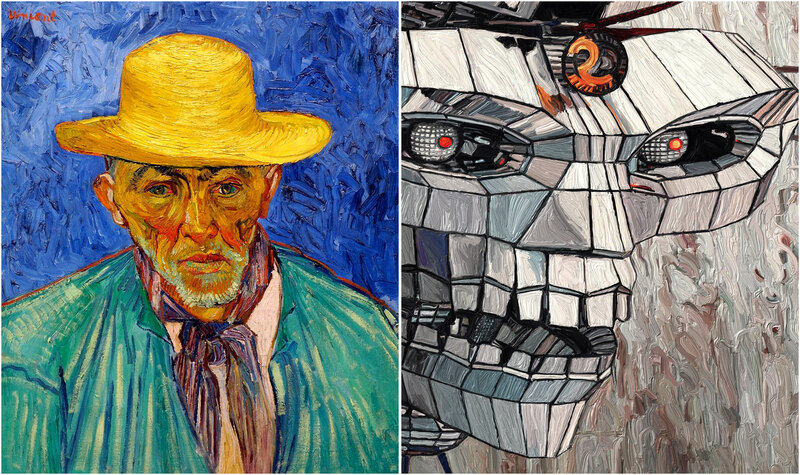 I was trying to paint robots similar to Van Gogh, digitally. CLICK FOR LARGER IMAGE. 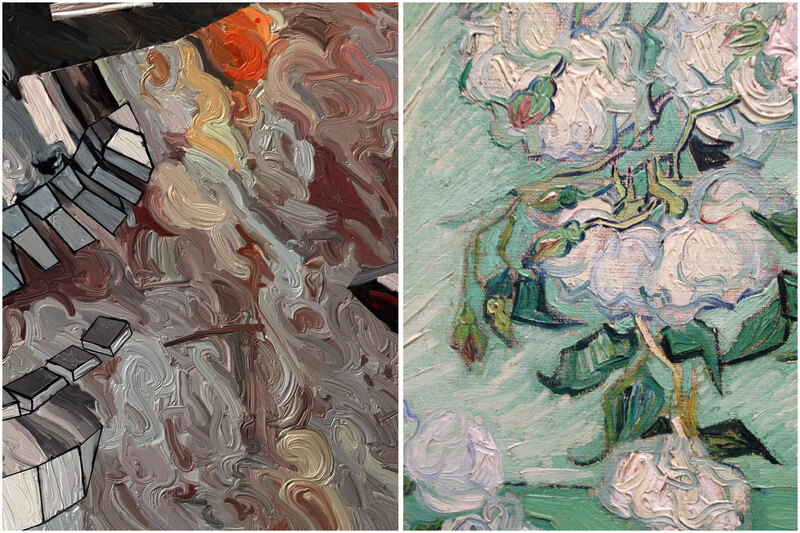 Detail of my digital painting, and a detail of Roses by Van Gogh. CLICK FOR LARGER IMAGE. Francis Bacon is also a huge influence on me is, and at one point I decided to make my robots into a triptych, much like his famous triptychs. I worked on the image in 3 sections, but also included a couple wide overlapping margins so I could create a seamless continuation between the panels and fuse them into a single image. However, if I divide them, you can see how each robot head fits well within one panel. 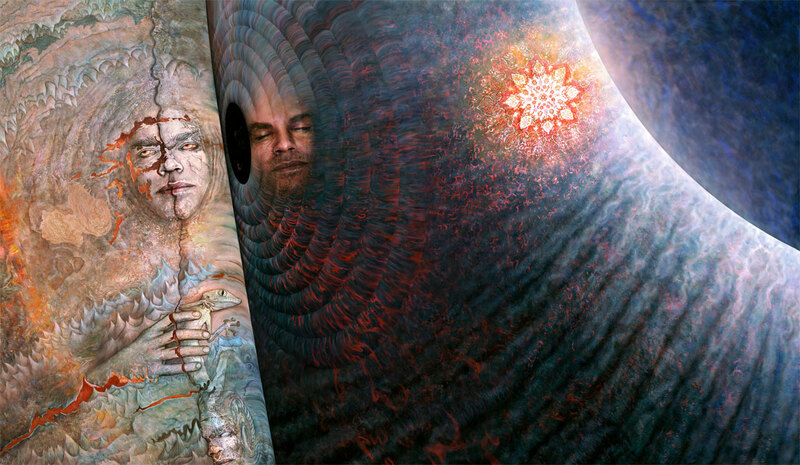 I intended it as a triptych, or as a seamless image. If you follow the art world closely, you might recognize the Bacon triptych below which sold for a record US$142.4 million in 2013. Three Studies of Lucien Freud, by Francis Bacon (1969). I was thinking more of his head portrait triptychs, though, like the one below. Three Studies for a Portrait of George Dyer (1964), by Francis Bacon. 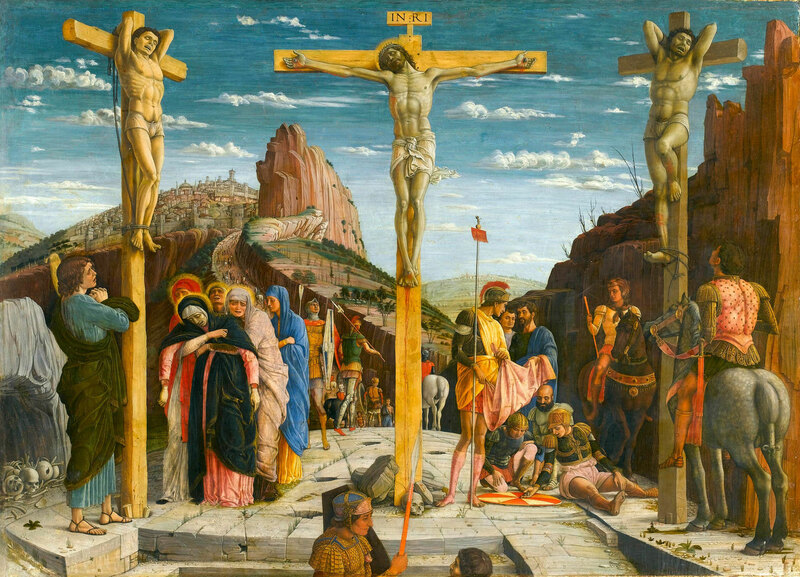 The Crucifixion (1457–1459), by Andreas Mantegna. Deconstructionist postmodernists like to say that an artist or writer cannot claim authority over the meaning of his or her own art, and it’s up to the reader or viewer to bring their meaning to it. I’ve never been impressed by that argument. For decades I thought when Ozzy sang “mental wounds not healing” in Crazy Train, he was singing “pencil bone not healing”. I never could make sense of those lyrics. The best I could come up with was that it had something to do with the comedy song, pencil neck geek. From a deconstructionist perspective, my interpretation in my teens, based on mis-hearing the lyrics, is as legitimate as the singer’s original intent. I believe the artist has the final word, so, here is my interpretation. The robots are being destroyed because they are conscious. They were created to be conscious and intelligent, but when the experiment succeeded, they were deemed too dangerous. The one on the left is being blown up, the one on the right is probably aware of impending doom, and the one in the middle is fully cognizant he’s next, as well as horrified by what is happening to his peer. The robots are numbered: 0 is exploding, 1 and 2 are next. Their bodies aren’t connected to their heads yet (though the wires coming from the neck indicate they would be), because all the focus is on their minds. They are in something like an assembly line, hung from bars and connected by flexible cables. As with most my work, I veer toward ambiguity. There are two basic takes we can have on the piece. The robots are dangerous because of their intellectual superiority, therefore are a threat to humanity, and must be destroyed. Their eradication is a good thing. They are the enemy. Because the robots are conscious and at least understand the immediate situation they are in, destroying them is murder. They are tragic victims, like Frankenstein’s monster, annihilated by their creator [this interpretation resonates with the crucifixion images in art history]. You could even see it as a genocide of a species of intelligent awareness. Which interpretation is the more correct? Both at the same time, to some degree. I suppose comparisons with the beheaded victims of extremist groups, and radical ideologies, also can’t be avoided, and are not entirely inappropriate. The title, Infinite Objectivity, which I also intended to be ambiguous, has a few related readings (which do contradict one another). The robots have infinite objectivity because they aren’t driven by emotions and selfish biological imperitives. This doesn’t mean they are necessarily dangerous. The notion that they would want to destroy us, either to protect themselves or protect the environment, is to anthropomorphize pure intelligent awareness. They might find our human consciousness to be the most precious thing, and strive to protect it. They might endeavor to prevent wars, or selectively sabotage polluting industry. It is “infinitely objective” to destroy the robots [this would be ironic since humans are incapable of absolute objectivity…]. As much as we humans want to explore any and all scientific possibilities, creating alien conscious intelligences greater than our own is foolhardy, and the creators of the robots must put aside their personal quest, fame and fortune, for the greater good of protecting our species. 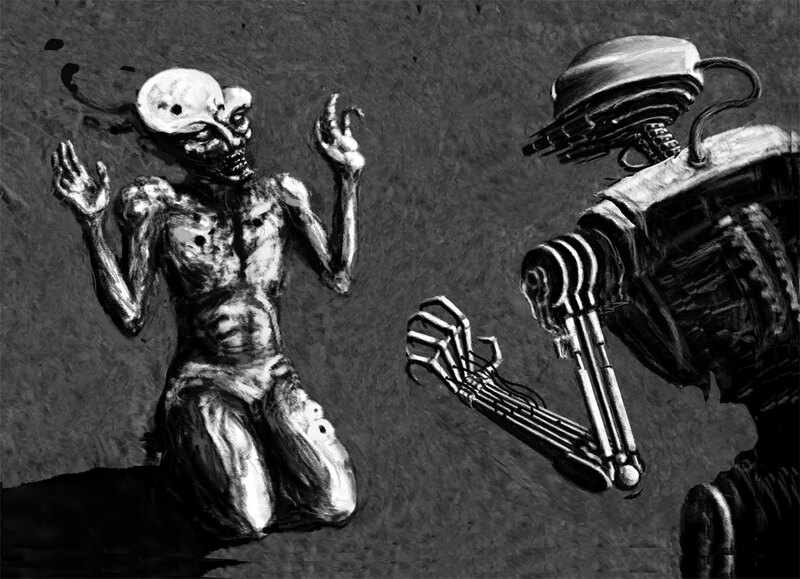 The robot that is being destroyed is facing the infinite objectivity of selflessness in the void. His one eye seems frozen in awe at the incomprehensible magnitude of the indivisible totality of being and not being [ even for an artificial intelligence ]. This hits on themes you can see in a lot of my art: consciousness, the nature of existence, and annihilation/death. It’s similar in some ways to my much earlier piece, Death, Dissolution, and the Void, and last year’s Awakening Upon Death of the Bride of the Creature. Death, Dissolution, and the Void. Robots are a recurring theme in my work. I made an image of a robot fighting a cephalopod sort of creature, and the one I’m now working on features a malevolent strain of military/police robot. 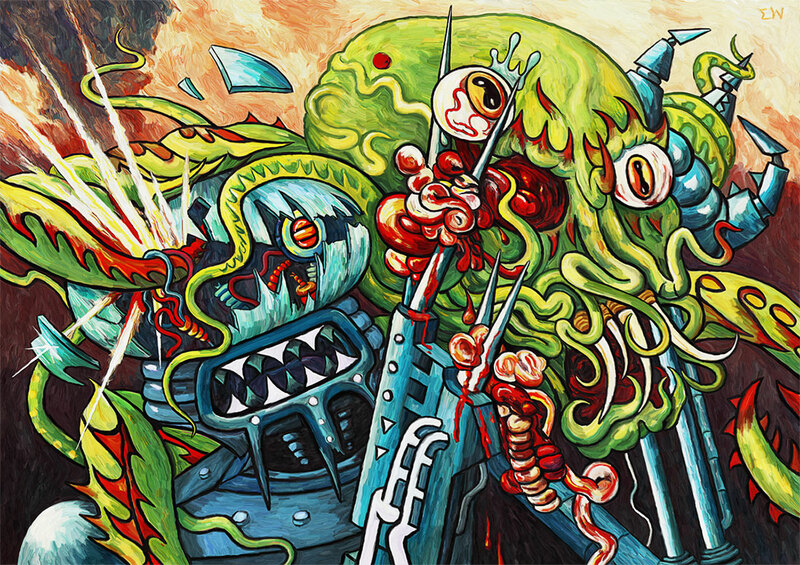 Robot Vs. Monster, by me. This next one is the last one I hope to finish before moving. I’m not using Blender this time, and am just employing traditional drawing skills to render it. The inevitable distortion seems to add subjective impact. You can see the influence of Bacon, again. I’m hoping to finish it in B&W, then make a color, digital impasto painted version. Posted in artTagged art, artificial intelligence, contemporary art, cyborg, digital painting, horror, painting, robot, sci-fiBookmark the permalink.